Synseal’s new Warmcore inline patio door joins the many aluminium sliding doors available today. It is another contender for homeowners and the trade to consider when choosing a new sliding door. We take an in-depth look at this new sliding door joining the Warmcore bifold, entrance door and windows family. The new Warmcore inline patio door faces stiff competition. The patio door market is growing and the Warmcore inline patio door faces a lot of competition. Visit any trade show, renovation exhibition or home improvement showroom and there is a huge choice in patio sliding doors. Smart Systems and AluK continue to dominate the mainstream ‘builders favourite’ market with their Visoglide and Optio BSC94 patio doors. Available with 35mm and 45mm interlocks, they join the other trend in sliding doors. That is slimmer doors with thinner interlocks or mullions. Then we come to the other growing trend in aluminium sliding doors. That is the minimalist or slim-framed sliding doors. 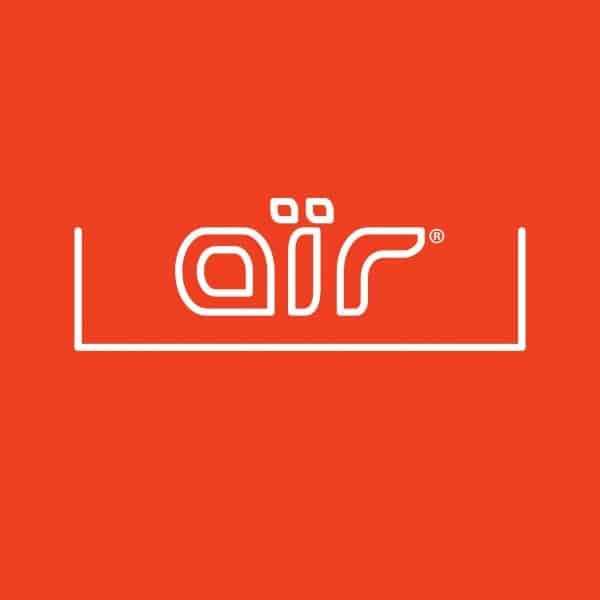 Origin, Air, Infiniglide and several other brands use the Spanish Cortizo product. The Infiniglide 6 by Arkhay Windows uses the Greek Orama system from Exalco. With the new Warmcore sliding patio door, Synseal is not out to take on the ultra-premium door market. Their new door is attractive but thick compared to much slimmer systems on the market. We will examine sight lines and where this product can sit further on in this review. Everyone knows that the monetary savings to be made between a super energy-efficient product and a standard C-Rated window are not substantial. We don’t see homeowners choosing a product solely on the back of how energy efficient it is. Homeowners expect energy efficient windows and doors as standard, even if the sales messages around energy efficiency remain as confusing as ever. Features of the new Warmcore sliding patio door. Synseal’s new Warmcore sliding door is a latest-generation aluminium slider with PVCu thermal core and aluminium extrusions inside and out. It is only an inline door with no lift and slide option available. You also only get a single track. This is another reason why the door sits in the middle market rather than the high end. To create a lift and slide as well as a multiple track sliding door exceeds the capability of the Warmcore system. You can buy the Warmcore door in the following configurations and size limits. A surprising limited choice of colour with Warmcore sliding doors. As you would expect from an aluminium sliding door it is powder coated. However, it appears only to come as a white or a grey door. You only get Grey RAL 7016 and what Synseal calls “Pure White’. There is no mention of any other colour availability. Given it is already powder coated and the colour availability across other Warmcore we see no reason why the RAL colour range is unavailable. A probable reason for this is lead times and stockholding but a weak reason nonetheless. A system company of Synseal’s calibre can comfortably accommodate other powder coated colours. All they need to do is work with a reliable powder coater. We would love to hear from Synseal on why a door brought out in a competitive market offers such little colour choice. Warmcore sliding doors will appeal to homeowners for their safety features. Up to now, we see a new to the market patio door that only has panels up to 2metres wide and 2.4 high. Many other door brands go bigger. Warmcore only comes in two standard colours. Other brands offer more standard stock colours and at least 150 other colours. However, the Warmcore inline patio door excels in its operation and its clever safety features. We tried the beta version of Warmcoore at the 2017 FiT Show finding it smooth as butter to open and close. The door uses a highly-engineered wheelset having 10 self-levelling rollers on each sash. And it works. The sliding action of the door is super-smooth and very light. Rarely seen on a patio door is the safety brake system. Safety Brake is an option that prevents the doors from being slammed shut. It also works as an anti-finger trap device. This will appeal hugely to families choosing bifolding doors on the back of their finger safe gaskets. The safety brake slows down the door to a soft final close, dampening the closing force significantly. The door offers this safety feature on either the lock side or opening side as well as both sides. What we think of the new Warmcore Inline Patio door. What the new Warmcore inline patio door does is offer another new product to sit in the general patio door market rather than the high end. It is hard to know just how successful Warmcore has been as a concept. Synseal markets the entire Warmcore suite on the back of the full-width PVCu thermal core giving better U-Values with less expensive glass. Warmcore windows are good looking but we say aesthetics matter far more to homeowners than energy efficiency. That said, many established trade fabricators and manufacturers sell a lot of Warmcore. Examples are Total Glass, TWR Bifolds, Quickslide and others. Aluhaus in Nottingham has taken the Warmcore bifolding door and substantially re-engineered it, creating a rather special folding door as well. We have not focused much on the security and weather performance standards of the Warmcore patio door. The reason for this is any new door today will come with good security and weather performance credentials. It is as secure a door like any other. The Wamcore sliding door is upgradeable to a Secured By Design specification with a simple laminated glass upgrade as well. The handle is a one piece, lift to lock arrangement only having a grey or black colour option. As a result, this limits the personalisation options some more. For installers, there is a 35mm add-on for a trickle ventilator as well as 25mm frame extensions. You also get a big choice of cills. The low threshold and DDA compliant threshold is a very useful thing on a sliding door. It is easy to slide open and shut and the safety brake is a great feature of the door making it family friendly. So is the Warmcore sliding door worth buying? 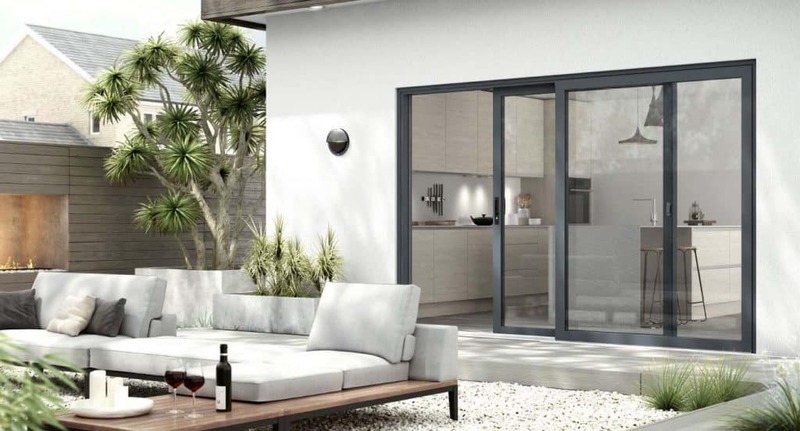 If you want a highly insulated aluminium door that is flush and modern in appearance, if a little chunky, then the Warmcore inline patio door is a good proposition. The interlock is 84.5mm making it twice as thick as the Smart Systems Visoglide door with the slim interlock. That said, slim interlocks are widely marketed but some of the best looking doors are reasonably thick in appearance. You can see how Warmcore compares in sightlines to other sliding doors on the market. The new Comar sliding door we recently reviewed appears a better proposition as a lift and slide option. The limited colour choice we think is an issue even though white and grey are two very popular colours. Black would be a good third option. 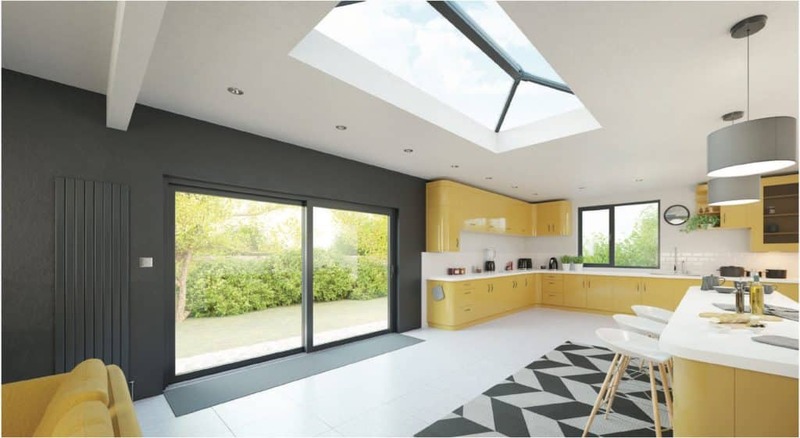 Finally, the Warmcore door gives a one-system solution in the home with an entire suite of Warmcore aluminium products that also includes the Stratus Lantern Roof. If you like the door, the price is agreeable and you are confident in the company supplying it, then buy it. Looks modern No lift and slide option. Excellent Sliding Action Disappointingly limited colour choice. Contact us for more information and where to buy this new aluminium sliding door. Hello Peter, sincere apologies for the late reply. Aluhaus in Nottinham should be able to help you with these.